ST VINCENT 1948 GEORGE VI SILVER WEDDING SET. VERY FINE - MM. St Vincent GVIth SG149-153,154,-158 m/mint. IF YOU ARE ORDERING MORE THAN ONE ITEM. 164,164a,165,166a,167a,168,169a,170,170a,171,172. Minimum order for cheques is £10. St Vincent 1948 Royal Silver Wedding SG 80-81 Mnh. St Vincent. SG 162-163. 1948 Royal Silver Wedding. Fine unmounted mint. 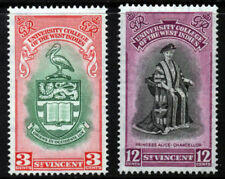 ST VINCENT THE 1938-47 SET 15 FINE UNMOUNTED MINT (MNH),SEE SCANS. St Vincent 1948 KGVI Silver Wedding set complete superb mint never hinged. Gibbons # 162-165. Scott # 154-155. St Vincent KGVI 1949-52 Definitive set (18) SG164/77 Mounted Mint. KG6th pictorials 6 values (from set of 15) fine used on small neat envelope; Kingstown cancels dated 11 Mar 1938;. Fresh never-hinged Mint. SG 162-3, Cat. Rest of World = £2. St Vincent 1949 KGVI 7c blue-black & blue-green block MNH. SG 170. Sc 162. St Vincent 1949 KGVI 7c blue-black & blue-green block of four superb mint never hinged. Gibbons # 170. Scott # 162. ST VINCENT THE 1938-47 SET 15 FINE MINT,SEE SCANS. 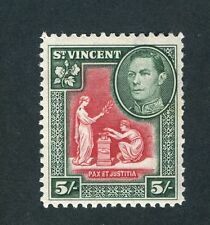 St Vincent 1938 KGVI 5s scarlet & deep green superb MNH. SG 158. Sc 150. St Vincent 1938 KGVI 5s scarlet & deep green superb mint never hinged. Gibbons # 158. Scott # 150. ST VINCENT 1938 KING GEORGE 6TH 5/- SCARLET AND DEEP GREEN SG,158 MOUNTED MINT NICE AND CLEAN CONDITION. Mounted mint, 2d tiny thin in a paper adhesion.